After a hard fought win over a tough SEC rival, you don't complain -- you savor the win. After taking a lot longer than expected to finally dispose of a stubborn Alabama team, there are many questions surrounding the Florida Gators’ identity right now. But no questions surround Urban Meyer’s record this season: five-and-oh. After a hard-fought SEC win, you don’t complain, and you savor the satisfaction of having an unbeaten month while avenging that 31-3 loss in Tuscaloosa last season. But with that having been said, the same unblemished record Florida has now could turn into an ugly crooked number in a few weeks. An unbeaten September would mean nothing if October turns into a train wreck. In the immediate aftermath of this win over Alabama–and it was a win, after all–it would be inaccurate and, furthermore, unfair to the team and coaching staff to say that Florida is in trouble. That would be an overly alarmist statement to make. But in the same breath, it would hardly be an exaggeration to say that the Gators and Urban Meyer are living dangerously, walking along a very fine line and always on the verge of defeat. This reality can be applied in many ways, in reference to both the season as a whole and to Florida’s win against the Crimson Tide this afternoon at the Swamp. The first sense in which Florida is living on the edge concerns the personality of Florida’s offense. While there’s no doubt that Meyer and offensive coordinator Dan Mullen have made substantial progress from season one to season two, they’re still trying to figure out what they want to do on offense. That’s not intended to be a criticism at all; it’s actually a very understandable approach when you consider Tim Tebow’s lack of polish as a passer, combined with Chris Leak’s senior experience and leadership. 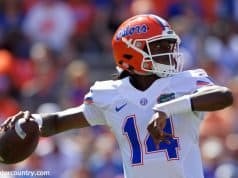 The older player–and better passer–is also the one who can’t run as well (despite a 44-yard bolt from the blue that electrified the ballpark and led to UF’s first touchdown), and who brings a slower tempo to the huddle. This necessarily hamstrings Meyer and Mullen as they find ways to unlock the full potential of this offense. The complicated reality of Florida’s offense was made even more unclear on Saturday against the Tide. Leak’s 44-yard run in the second quarter, combined with Tebow’s very impressive 23-yard strike to Jemalle Cornelius in the third, only served to further blur the boundaries between the two signal callers. While Meyer wisely (and this was talked about in last week’s Instant Analysis after the Kentucky game) used Tebow on an appreciably liberal basis in an attempt to mix up personnel groupings and offer Bama’s defense a wider variety of selected plays, he never seemed to fully open the playbook after Tebow’s pass. Once Leak had demonstrated an ability to run, and once Tebow then demonstrated an ability to pass, it was reasonable to think that Meyer and Mullen–who had intricately and thoughtfully crafted whole series up to that point to set up Joe Kines’ defense (as was the case on Leak’s run, beautifully disguised and then blocked by Billy Latsko, who made the play work)–woul d then unleash the full playbook on Bama. It never happened. It took the efforts of Florida’s defense to break the game open with two turnovers. Where do Meyer and Mullen go from here? Do they give Tebow more pass plays and Leak more running plays? Do they lean on their defense, or choose to give more responsibility to the offense with LSU and Auburn coming up? Do they continue to script lengthy drives by setting up a third-down play by Leak with a first-down play from Tebow (or vice versa), or do they start trying to attack vertically, specifically to mismatch-taking, touchdown-making Dallas Baker? None of these are easy questions to answer, and it would be both foolish and (as a journalist) unprofessional to suggest that Meyer and Mullen take one path instead of the other. The only point is that, whatever Meyer and Mullen choose, they’re living on the edge. Another way in which UF is living on the edge concerns a defense that was fairly schizoid in its own right on Saturday. On one hand, the lack of a consistent pass rush from the base front four has to be a mammoth concern. On the other hand, the run defense is still pretty stout, and in terms of the one statistic that really matters–points conceded–Florida’s D essentially came out “plus eight,” given the fact that the Gators directly scored seven points, immediately set up seven more, and then allowed 6. That’s a net of eight points. The only problem is that this came against an Alabama offense that doesn’t have anything close to the assemblage of thoroughbred studs LSU will throw at the Gators next week in Gainesville. Florida’s defense–like the Gators’ offense–walked a very fine line on Saturday. A third and final way in which the Gators are living with a small margin for error is their energy level. 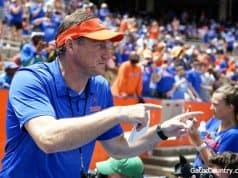 Tony Barnhart–on the CBS telecast–reported from the Florida sideline that the coaching staff was shocked at the low energy level displayed in the first half. But when positive things began to happen in the second half, Florida noticeably cranked up the intensity to get the job done at the business end of the proceedings, otherwise known as the fourth quarter. A defense that shockingly allowed Bama to march quickly downfield in the final minute of the first half was then able to turn around, get a sack, and keep the Tide off the board. All in all, it was a Jekyll and Hyde afternoon for a team that must be profoundly more consistent if it expects to win even two of its next three bigger-than-big-league games. 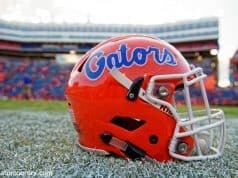 Perhaps Florida will come up with the response needed to rise up and beat LSU next weekend. Urban Meyer’s team has a lot of potential, and after losing by just four in Death Valley last season, a home date against the Bayou Bengals offers the Gators a huge advantage. Furthermore, the name of this game is to simply survive and advance to the following week, and so far, the Gators are doing very well on that score, thank you very much. But with all that having been said, the following shouldn’t have to be debated: Florida’s living on the edge right now. This team has a very small margin for error, and is still very much in the process of searching for better answers and more effective solutions on both sides of the ball. The LSU game–and other big battles coming up in October–will involve the same basic tension point: how does Urban Meyer juggle the competing needs to trust his defense while enlarging his offense, to avoid foolish (over-)experimentation while displaying added aggressiveness in scheme, game planning, and situational play calling? It will be fun… living on the edge always is.